Guys. It’s May. And soon it’ll be June and then I scream because after that is Hari Raya. 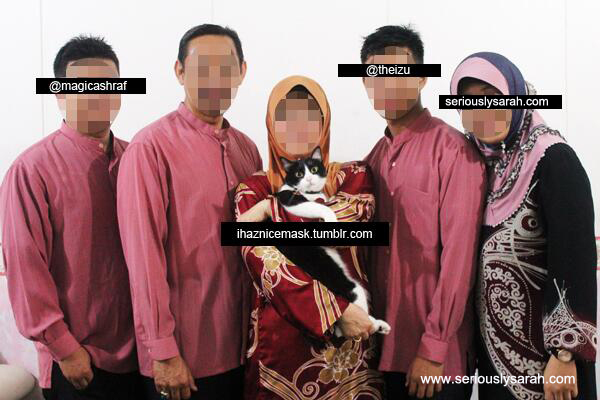 Yeah, that’s me with everyone posing for Hari Raya and yes, we all have assorted urls, even for Dawn the cat. Anyway Ramadhan starts around 18 June this year and that means it’s time to pay back if you know what I mean. Ok, if you don’t, it means FOR THOSE WHO COULDN’T puasa last year, you got to ‘pay back’ before it hits this year’s Ramadhan. You knooow? It means to fast the days you didn’t get to do because of blood magic girly stuff/illness/whatever. SO THIS IS YOUR REMINDER TO PAY BACK. And then after that, you can prepare for Hari Raya things. Like, kueh and clothes. And yes, my family does do the whole colour scheme thing so while we might not all wear the similar things, we might have a colour theme? I don’t know. Once, I wanted us to go in Power Ranger colours and I called dibs on pink but nooo, that’s just so much work or something. Still, it would be cool if we had. We have enough people for red, blue, yellow, pink and black. Bonus green for Dawn the cat?? And then if anyone notices the colour scheme, I’d go yessss. So a reminder, fasting month begins around 18 June. The month where your non-Muslim friends go “OOPS, I FORGOT. AHHH SORRY” when they say you wanna go eat stuff or something. No worries though, after that it’ll be holidays yay! Ps. I’d just buy my kueh. Ah ha ha ha haaaa. Previous Previous post: Doujima 2015!